Note the sharp tooth-like shape of dandelion leaves. Dandelions are not native to the Americas but, over the centuries, they have spread and dispersed widely and become the bane of the suburban lawn. With massive encouragement from chemical and pesticide companies, we are vigorously trying to exterminate them. This mania for the perfect, weed-free lawn came to prominence after WWII when chemical companies marketed herbicides as weapons men could utilize in the war on weeds, especially dandelions. The 1950s and beyond: the quest for the emerald green weed-free lawn. At what price? Now that the war was over, men could turn their attention to defeating another enemy: dandelions and other weeds defacing the longed for perfection and conformity of the green suburban “lawnscape. Below is a TV ad for a well-known weed killer used on millions of U.S. lawns. The ominous, threatening, doomsday tone of the ad is almost laughable if it were not for the severe consequences resulting from the use of this product. As a nation, we pay a high price for our intense, continued use of herbicides and pesticides on American lawns. See the following “digression” for a brief discussion and another video. This declaration of war on weeds had an unintended consequence for future generations. Today, run-off from lawn chemicals and herbicides is the leading cause of water pollution in the U.S., outstripping all agricultural uses combined. The carcinogenic effects of lawn chemicals have caused many undesirable medical and health outcomes (allergies, cancer, skin conditions…). Children, parents and pets play and walk on treated lawns and bring these compounds into our homes. They contribute significantly to the “chemical soup” we currently live in. All this has largely occurred as a result of the migration of the dandelion from Europe during the colonial period of the 17th and 18th centuries. The point is, small events may have substantial repercussions. The following video briefly outlines the dangers posed by the intense use of lawn chemicals in the U.S.
END OF DIGRESSION. ON WITH THE STORY. Actually, dandelion greens are very nutritious and can be purchased in the produce sections of some food stores, especially in the spring. Or, you can harvest your own from nearby fields or other open areas in your neighborhood. Better yet, harvest them from your own yard! Dandelion leaves are a nutritious free food. They possess a high concentration of minerals and vitamin C, and are a digestive bitter that assists the stomach in producing hydrochloric acid. Embracing the Enemy: Dandelions are a good thing! In the “wise woman” tradition of herbal medicine, dandelion flowers steeped in boiling water can be used to heal and beautify the skin. Dandelion blossom tea can be used as a pain reliever for menstrual cramps, headaches, backaches and stomach aches. The white sap found within the stalks, leaves and roots of the dandelion can be used to dissolve warts, corns, calluses, old sores and blisters. This healing white sap is said to be an excellent aid in relieving bee stings. Dandelion wine? Dandelion salad? Roasted dandelion root makes a medicinal tea that aids the liver, kidneys and blood. Dandelion greens are also a blood and liver cleanser. 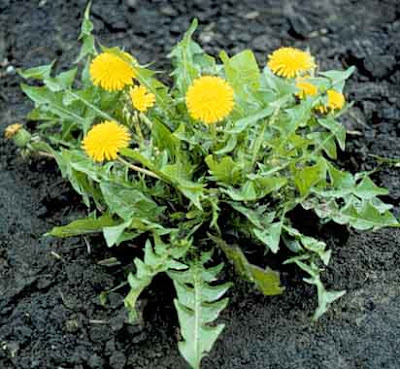 It is a strange but true fact that the herbicides that kill dandelions can cause severe damage to the liver, while eating the dandelion greens themselves will help cleanse the liver. Working at cross purposes.The list of uses for the dandelion is extensive. If you are interested, I refer you to Susan Weed’s classic herbal medicine text Healing Wise. Susan Weed has a lot to say about dandelions and other wild herbs and plants. Save the dandelion. It does not deserve to be exterminated. It has a long history. During the Middle Ages in Britain it was used to brew a dandelion beer. I wonder how it tasted? Wisconsin Holsteins in a field of dandelions. ← Who began the practice of “scalping” in U.S. history?